I spell well naturally. I always have. So does Will. And Munchkin (age 8). But Seahawk (age 11) struggles. So I’m always on the lookout for a spelling program for him that will help him learn HOW to spell (not just provide him with a list of words to memorize, test on, and forget). That’s what the goal of Spelling You See is. 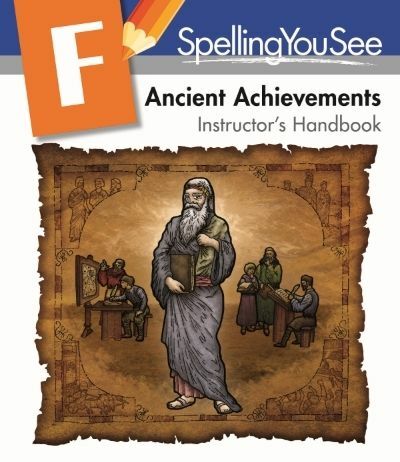 For this review, we reviewed one of the two newest levels of Spelling You See, which is called Spelling You See Level F: Ancient Achievements. The program was designed after years of research by Dr. Karen Holinga, and the goal is to get students to begin noticing letter patterns within the context of “real” text (as opposed to a spelling list of randomly selected words). The way this is accomplished is by having students read a passage aloud and then search for specific letter patterns within the words. This process is called “chunking” because each letter pattern (chunk) is colored with a specific color. Each passage is worked for a full school week, and the student searches for the same letter patterns each day. The second half of the program is a combination of copywork and dictation. 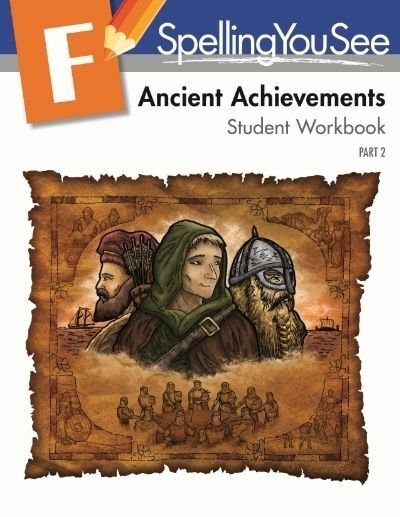 For the first three days each week, the student copies a portion of the passage (roughly half of it, in an A-B-A pattern). On day 4, the parent/teacher reads the passage aloud, and the student writes it down, doing their best to spell everything correctly. During day 4, the student is “allowed” to ask for help with spelling the words if they need it. On day 5, the student works from dictation again, but the goal this time is to avoid asking for help. Hopefully by working the passage four times before this, the student will remember the letter patterns. The teacher’s manual instructs you to work through dictation for no more than ten minutes per session. Whether your student finishes the passage during this time or not is irrelevant. The goal is to work through as much as possible without overwhelming your struggling speller. The physical student books you receive in the Spelling You See curriculum are “open and go”; there’s no prep work required. When you purchase the program, there are two elements you need. The first is the student books. For a price of $30, you get two student books (enough for a full year of spelling curriculum) and a packet of Crayola erasable colored pencils to use for chunking. 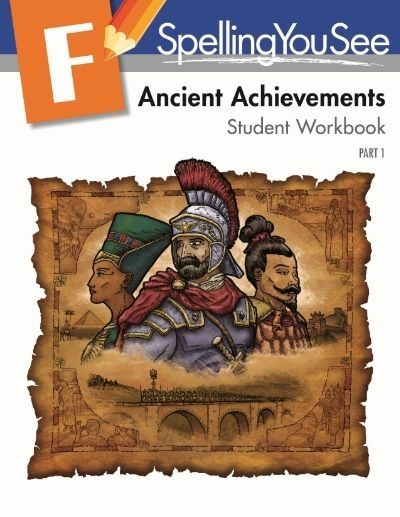 The student books each contain 18 five-day lessons. Each individual lesson takes up a two-page spread in the workbook (one page for finding the chunks, the other for copywork/dictation, depending on the day). The second thing you need is the teacher’s manual, which costs $14. While you might be tempted to skip this purchase, I don’t recommend it. Sometimes those chunks are tricky to find because our brains skip right over them (the “th” in “the” is considered a consonant chunk, for example, because it’s two consonants that make one sound; it’s so ingrained in our heads as just “the,” though, that it’s easy to miss), and you’ll want that teacher manual to help you help your student. The program is designed to be used 5 days a week for the entire school year. A few weeks ago, we adjusted our school week to run four days a week because we found we were spending all day on Monday running errands and we ran out of time for school. Instead of feeling bad about that, we rescheduled our subjects to make them work on a four-days-a-week schedule. Spelling You See was no exception. Since day 3 is essentially a repeat of day 1, that’s the lesson we skipped. This means we did Monday’s lesson on Tuesday, Tuesday’s lesson on Wednesday, and then Thursday and Friday lessons on the “right” days. The lesson page for Wednesdays contains an extra piece of information (tidbits about word roots, for example) that isn’t on the other days, so we made sure to read that on another day so as not to miss out. As for what we think about Spelling You See? I like it. I like the open and go format, I like how it teaches students to notice letter patterns that are common in the English language, and I like how easy it is to implement. I especially like how the focus is on how many words the student spells right, not on the words they missed. (At the end of each dictation day, you count up the correctly spelled words and record that number at the bottom of the page.) Seahawk, on the other hand, does not like it. But that’s just because it’s hard for him. He’s not a good speller, remember? He has to work at it. His dislike of the program doesn’t mean that the program isn’t good; it just means that it’s not easy for him. Like most kids, he’d rather play than work, and Spelling You See is work for him. As we work through our second year of using Spelling You See (I reviewed Level D: Americana last year), I hope to continue to see improvement in his spelling. At the moment, it’s slow in coming. But I am seeing some advances. I just hope it continues. 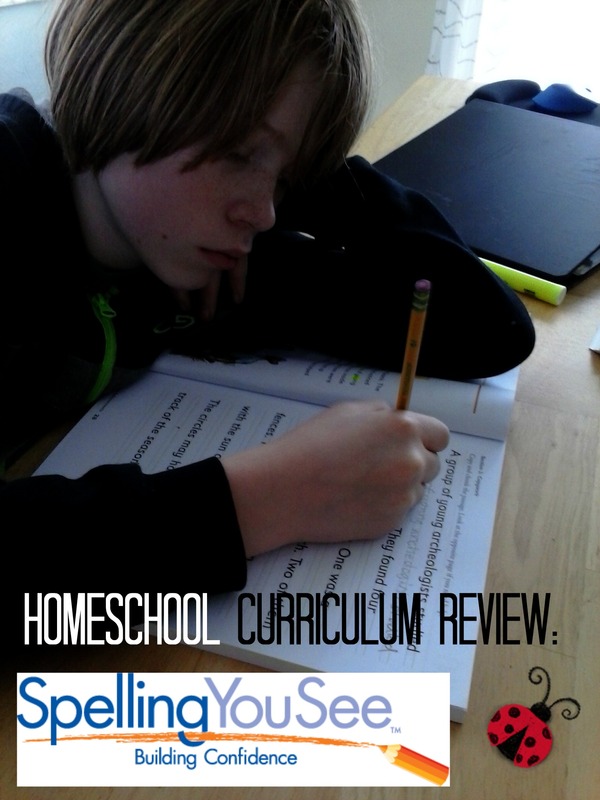 To read about other homeschool families’ experiences with Spelling You See, click the banner below. There are 40 of us on this review, and some reviewed Level F like I did, while others worked with Level G.